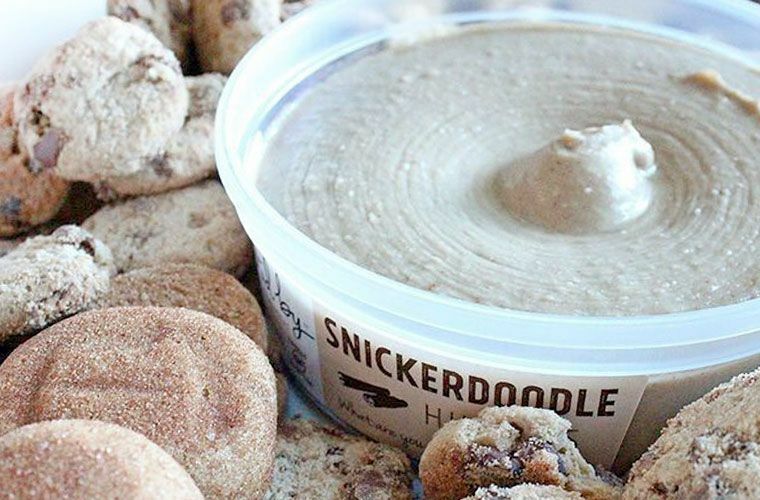 Is this dessert hummus actually healthy—or too good to be true? Have you, on occasion, stared down your tub of hummus, willing it to magically turn into a tub of ooey, gooey brownies? Well, if you’re like me and that answer is a wholehearted “yes,” then your dreams may have just come true. The company Delighted By is currently blowing up for its dessert-flavored hummus, but one question remains: Is the stuff actually healthy? Compared to classic hummus, the company’s dessert flavors—Brownie Batter, Choc-O-Mint, Snickerdoodle, and Vanilla Bean—surprisingly aren’t too far off from your healthy go-to, ingredient-wise. The sweet stuff is even 100 percent vegan, gluten-free, kosher, and nut-free, and is only sweetened with better-for-you coconut sugar or raw turbinado. The company’s dessert flavors—Brownie Batter, Choc-O-Mint, Snickerdoodle, and Vanilla Bean—surprisingly aren’t too far off from your healthy go-to, ingredient-wise. But let’s compare nutritional stats more closely: While a typical 2 Tbsp serving of classic, plain hummus has around 60 calories with 2 grams of protein and 0 grams of sugar, these dessert varieties clock in between 50 and 60 calories (except for the brownie flavor, which is 80), 1 gram of protein, and 4 to 6 grams of sugar. So, yes, there is more sugar, but not a totally outrageous amount, compared to other confections. So, sure—you’re getting a little less protein and a notable increase in sugar, but as long as you stick to the suggested serving sizes, it’s a dessert you can feel good about. Anyone up to try a carrot-and-Snickerdoodle combo? Here are three healthy desserts to work into your rotation. Or, check out the new machine that allows you to make frozen yogurt in your own home.